We’d love your help. Let us know what’s wrong with this preview of Little Green Men—Attack! by Robin Wayne Bailey. It’s all-out laugh warfare when Little Green Men – Attack! From the far reaches of outer space they come – inscrutable aliens, malicious invaders, wacky tourists from another planet – to conquer, study, and tickle us. From the battlefields of the Ozarks to the marble halls of the Boston Library, from Central Park to the skies above Washington, on the moon and in the seedie It’s all-out laugh warfare when Little Green Men – Attack! From the far reaches of outer space they come – inscrutable aliens, malicious invaders, wacky tourists from another planet – to conquer, study, and tickle us. From the battlefields of the Ozarks to the marble halls of the Boston Library, from Central Park to the skies above Washington, on the moon and in the seediest bars of Kansas City, they’re here! But do they really know who they’re up against? Here are nineteen top-notch science fiction stories guaranteed to make you think –and- laugh, featuring such major writers as Robert Silverberg, Mike Resnick, Allen M. Steele, Esther Friesner, Elizabeth Moon, Seanan McGuire, Jody Lynn Nye, Kristine Kathryn Rusch, James Gunn and many more. From Hugo-nominated editor Bryan Thomas Schmidt and Nebula nominated author Robin Wayne Bailey, Little Green Men – Attack! will attack your funny bone! To ask other readers questions about Little Green Men—Attack!, please sign up. Be the first to ask a question about Little Green Men—Attack! Not a review. Includes my story "A Fine Night for Tea and Bludgeoning." One of the advantages of going to science fiction conventions is that you learn of books you'd never otherwise hear of. In this case, the book was Little Green Men - Attack!, which is a (mostly) humorous collection of short stories featuring, well, little green men. I learned of the anthology when Martin Shoemaker read his short story "Meet the Landlord." In it, humans have colonized Mars and 30-some years after that "Martians" show up looking for back rent. It was hilarious. Most of the stories One of the advantages of going to science fiction conventions is that you learn of books you'd never otherwise hear of. In this case, the book was Little Green Men - Attack!, which is a (mostly) humorous collection of short stories featuring, well, little green men. I learned of the anthology when Martin Shoemaker read his short story "Meet the Landlord." In it, humans have colonized Mars and 30-some years after that "Martians" show up looking for back rent. It was hilarious. Most of the stories were funny, although in "First Million Contacts" the joke was on the humans. In every anthology, there's a story that's the exception to the rule, which in this case was Steven H. Silver's "Big White Men - Attack!" in which the green dust kicked up by Armstrong an Aldrin on the moon isn't dust at all. Very solid, amusing collection of little green men stories. Very original takes, very different approaches, all humorous. Definitely recommended for someone looking for some light, fun, fast reading. What an interesting collection! So funny. The Green, Green Men of Home by Celina Rosen was hilarious!!! Okay but stories became tedious about 2/3 way through. I can highly recommend this book! Some seriously great writing by a lot of authors! I know I'll be rereading this collection again and again. This book had me groaning and laughing out loud. Not just a funny book it contains insight into human nature. An overall really enjoyable anthology of comedic SF stories built off of the classic SF trope that aliens are "little green men." In most of these stories, the aliens are in fact some combination of "little," "green," and "men," although not necessarily all three at the same time (and in one or two of the stories, the aliens are none of the three, exceptions that prove the rule if you will). There are some themes that recur (for instance, the idea that aliens learn what they know of Earth from ou An overall really enjoyable anthology of comedic SF stories built off of the classic SF trope that aliens are "little green men." In most of these stories, the aliens are in fact some combination of "little," "green," and "men," although not necessarily all three at the same time (and in one or two of the stories, the aliens are none of the three, exceptions that prove the rule if you will). There are some themes that recur (for instance, the idea that aliens learn what they know of Earth from our television transmissions or aliens who think looking like cats will help them conquer the Earth), but even so the stories are very individual. Some are gut-laugh funny, others are whimsical. Some are subtle, some are slapstick. "Little Green Guys" by K.C. Ball. Given my love for "Guys & Dolls" and for Damon Runyon in general, how could I not love this Runyon-esque Roswell alien landing story? Really, how could I not wish I had written it? Absolutely my favorite story in the anthology. Great voice, great fun. "Stuck In Buenos Aires With Bob Dylan On My Mind" by Ken Scholes starts out as a "shipwrecked" type of tale, with music as the tool that crosses cultural divides -- almost too well. Again, great voice, great subtle jokes, and a bit of a heart-tugger. "School Colors" by Seanan McGuire. This is not the first story McGuire has written featuring the Johnson's Crossing Fighting Pumpkins Cheerleaders, but it might now be my favorite. Cheerleaders from Earth versus cheerleaders from an alien world? Cool. "A Fine Night For Tea and Bludgeoning" by Beth Cato. Victorian setting, confused aliens, and proto-roller-derby of a sort. Again, another great character voice. Cato is fully in her element. "Big White Men -- Attack!" by Steven H. Silver gives us a look at the Armstrong/Aldrin moon landing from a very different, and much closer-to-the-ground, perspective. Fun. From psychic cats to french-kissing aliens, Baen's Little Green Men--Attack! offers up a variety of laughs from seasoned story tellers and editors. Each author takes the idea of little green men and runs with it in their own direction, sometimes playing with SF and conspiracy theory tropes, and sometimes shooting off into the unexpected--unless you were expecting Japanese mythological demons (“A Cuppa, Cuppa Burnin' Love” by Esther M. Friesner), or Victorian roller-skate-offs (“A Fine Night for From psychic cats to french-kissing aliens, Baen's Little Green Men--Attack! offers up a variety of laughs from seasoned story tellers and editors. Each author takes the idea of little green men and runs with it in their own direction, sometimes playing with SF and conspiracy theory tropes, and sometimes shooting off into the unexpected--unless you were expecting Japanese mythological demons (“A Cuppa, Cuppa Burnin' Love” by Esther M. Friesner), or Victorian roller-skate-offs (“A Fine Night for Tea and Bludgeoning” by Beth L. Cato) complete with satirically stiff Victorian style. And speaking of sportswomen who take their sport seriously, “School Colors” by Seanan McGuire is another particularly funny story featuring a paranormal-fighting cheer leading team that may remind readers of shows like Buffy the Vampire Slayer. 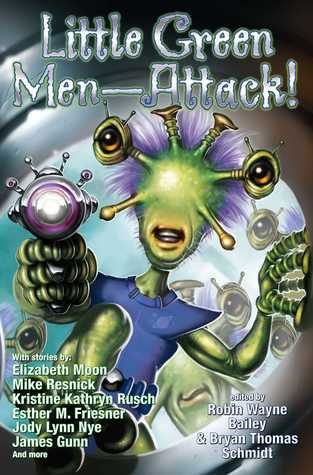 Turn the ridiculousness up another notch for “Big White Men—Attack!” by Steven H Silver, in which aliens the size of dust motes (Mars dust, to be precise) face off against unwitting astronauts Buzz and Neil. I enjoyed some of the perspectives, particularly when the aliens interact with regular humans. And I loved the library. Robin Wayne Bailey is an American fantasy and science fiction author and is a past president (2005-2007) of SFWA, the Science Fiction and Fantasy Writers of America. Robin also served as SFWA's South-Central Regional Director for nine years and has hosted three of SFWA's annual Nebula Awards weekends; two of those Nebula events were held in his home town of Kansas City, Missouri. Bailey was one of Robin Wayne Bailey is an American fantasy and science fiction author and is a past president (2005-2007) of SFWA, the Science Fiction and Fantasy Writers of America. Robin also served as SFWA's South-Central Regional Director for nine years and has hosted three of SFWA's annual Nebula Awards weekends; two of those Nebula events were held in his home town of Kansas City, Missouri. Bailey was one of the founders of the Science Fiction and Fantasy Writer's Hall of Fame in 1996, which merged with Paul G. Allen's Vulcan Enterprises in Seattle in 2004 to become part of the Science Fiction Museum and Hall of Fame. Robin continues to serve on its annual induction committee.